I'm following up yesterday's review with another fun Christmas book! This one is called THE GREAT CHRISTMAS KNIT-OFF by Alexandra Brown, and it's an entertaining story that reinforces all those feel-good things about the holiday season. It focuses on the goodness of people, and it's exactly what I needed to read this week! THE GREAT CHRISTMAS KNIT-OFF tells the story of Sybil, a woman who was left at the altar of her Star Wars themed wedding and still hasn't gotten her groove back. She is a bit of a mess in that she can't sleep and she's making mistakes at her job, and she really wishes she would just make a living selling knitting, crochet, and quilted items. Sybil decides to visit her friend in the small village of Tindledale in an effort to escape her dreary life. Tindledale is a quaint English village with adorable shops, and it has quite the cast of characters as its citizens. Sybil immediately feels comfort in this small town with all the generosity displayed by the villagers; however, when she meets Hettie and her House of Haberdashery, she really feels a sense of happiness and belonging that she hasn't felt for some time. When Sybil realizes that the 80-something Hattie is at risk for losing not only her store but her house, Sybil decides to help! It doesn't hurt that Sybil shares Hattie's passion for knitting. Together, they update the look of the store, set up a website for online orders, and even eBay some collectibles and completed projects. And when they receive a huge order for Christmas sweaters from some Japanese tourists, they just might be able to hold off the creditors and save the store! What starts as a brief weekend trip to Tindledale turns into a life-changing experience for Sybil. She makes many new friends and possibly finds a love interest, while also being able to help Hattie save her house and store. In the process, Sybil realizes the path in life that she wants to take and finds true happiness! I adored THE GREAT CHRISTMAS KNIT-OFF. The story was cute and the characters were quirky and fun. I found the book to be highly entertaining and it definitely hit the spot during my recent reading slump. Needless to say, this book was a quick read and had a chick lit feel to it (which I enjoy every so often); but it also felt like a contemporary Jan Karon book with the small town vibe and cast of characters. I will admit that THE GREAT CHRISTMAS KNIT-OFF was a little predictable, but that's perfectly okay with me for a book like this. Honestly, if things had turned out any different, I would have been disappointed. Given the storyline and that it was a holiday book, I wanted a happy/feel-good ending! 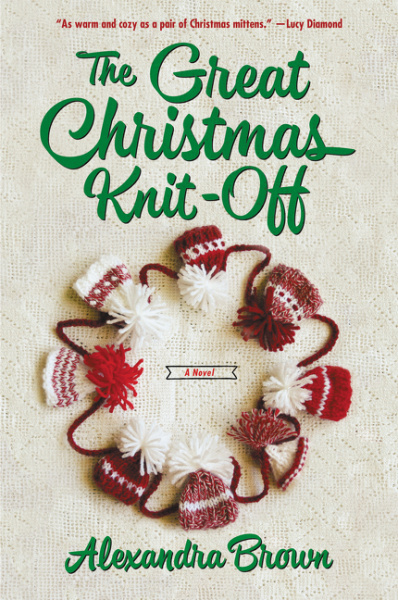 THE GREAT CHRISTMAS KNIT-OFF is the first in a new series by Alexandra Brown, and I, for one, will be sure to read more from this author. I will admit that this novel isn't my typical read, but I really enjoyed laughing at these characters. In addition, I loved the messages from this novel. It was so heartwarming to see everyone pitch in to help someone in need, and it was a beautiful reminder of what's important during this hectic time. THE GREAT CHRISTMAS KNIT-OFF is a cute story that's sure to be a winner for readers who enjoy sweet stories. It also would be ideal for a December book club meeting! I think we could all use a book that focuses on the goodness of people right about now. This sounds cute! Knitting and a cute story combined in a feel-good, positive book? Sounds like a great December read. Knitting? I'm adding it to my TBR list.